Hi (Hello to UK readers)! My name is Colin Chappell and while originally from Peterborough (UK), I moved to Canada in 1975 and in neither country did I consider a dog for a pet. Dogs were in fact annoying, soiled areas that I traveled on, chased almost anything that moved, smelled a little when dry, and smelled a lot when wet. I was bitten by Sabre (German Shepherd/Alsatian) who was probably protecting its owner from me. I was about 14 yrs old at that time and was only interested in trains so attacking big people was not a factor (but try explaining that to Sabre). In a moment of weakness in November 2012, I started talking to our local Humane Society about dog ownership with the view to maybe, just maybe, I might like to adopt one. I was starting to believe that it could be possible to have a really rewarding relationship with a canine. Eventually I decided yes, and so started looking for a good size, sociable, even temperament, huggy kind of dog. The plan totally misfired because while I was planning on possibly adopting a dog, Ray was planning on adopting me. His strategy was clearly better than mine because he moved in with us in March 2013. I would describe him as 75lbs of attitude in a fur coat! He was neither sociable, nor of even temperament and did not like to be touched. In fact the only area where he met my criteria was in his size. He was certainly a good size dog! With me and “a good size dog” starting a new life together, there has to be many stories and this blog will be updated regularly in an attempt to tell some of those stories! The emotional roller-coaster ride of the first 18 months of living with Ray, is covered in the book “Who Said I was up for Adoption?” (link below) which is available in Hard Cover, Paperback and eBook formats. All net profits from book sales will be directed to the Oakville & Milton Humane Society, who initially rescued Ray and spent four months working with him in order to make him an adoption possibility! I later decided to expand the Blog to include a variety of writings. These are now under various Categories, but stories of Ray remained under “Dog Stories”. Each Category can, of course, be selected separately if so desired. So I realized today that I don’t think I had ever read your About page! I have only been following you for the past 3 years now, and what a journey it has been. LOL! I did have to laugh at your reply to a comment that I saw as I was scrolling down. Have you put your glasses in the refrigerator again lately? 🙂 What a great comment for me to find, eh! Oh Colin, what a wonderful blog! I so appreciate your adoption of Ray and love that you wrote a book about it. Thank you for finding me and you’re welcome at my blog anytime. Colin…Hello! Loved reading your stuff here. Don’t know whether this will get to you, not up on too much tech’. This is Peter Read from King’s we in touch long time ago. If you wish do get in touch, if you on facebook you can find me there and, I have a group King’s School Peterborough Year of 1957/58. A few of us there my vintage and yours, we chat and remember, if that’s your thing. HI Peter. Will email you. Colin, was it your good self that recommended signing up to Scribophile? Not guilty! At least I don’t recall it! Yay……… another day……… another opportunity for smiles! You’ve found a loyal reader here…the pet lover in me is glued! 🙂 super cool blog! I enjoyed reading your writings. Thanks for sharing them. Sure i will. Have a great weekend. Welcome to my Blog. I like the way you think! The beauty about this cute, understanding and lovable dog (I was using many different adjectives to describe him 3 years ago! ), is that he also has a book available in which, unlike many dog books ….. he is still alive at the end! 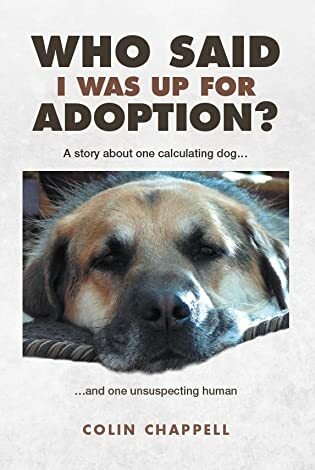 All profits from the book (“Who Said I was up for Adoption?”) are going to the Humane Society that rescued him, and whose trainers spent 4 months with him in order to give him adoption potential! If you like my style of writing, and the stories about Ray here in this Blog, then please consider treating yourself (and everybody you know who loves dogs!) a copy of his book! Again, welcome! Hello. You recently contributed a poem to the #PoetsforPeace collaboration. An online magazine liked the spirit of the collaboration, and asked to publish it. We need your permission to include your poem. Colin, I read your book (wonderful!) and want to put a shout out on my blog with your permission. I’d like to use the cover shot of Ray (or any other picture). Let me know if that’s ok.
Hi Kate – I am so glad that you enjoyed it, and you have without doubt learned so much more about me and my buddy Ray! Any book promoting on your part would really be appreciated and feel free to use the book cover shot. If you need anything else (original pics, other pics etc. ), just ask. Many thanks. Colin. If I need more, I’ll let you know. I have concluded that it is Ray’s face on your blog header? Super cute. He looks very huggable! Hi Terre – You have concluded correctly re the blog header and, yes, he is super cute and very huggable with us, but has not always been like that! yep! Bigger they get the difficult it gets! Mine is 7 years old and still tries to sit in my lap every now and then! Nothing works on her, not even scolding! Hi Jenny and welcome. Since this blog started in Oct 2014, it has attracted a really wonderful group of Followers and, as you will notice from various comments, it’s often like chatting with distant family! Our family always welcomes new members so again, welcome. Thanks! I feel very welcome 🙂 I love that about blogging, getting to know other bloggers. Thank you for following my blog! Thank you! I feel welcome already! Hi Jennifer – You’re very welcome. I hope you enjoyed your visit here and, as you now know, my background with pets is cats and rabbits! Correction! You probably would not know, but Ray was/is my first dog! My past includes 5 cats at various times and 3 rabbits. My highlight (?) was having 2 cats and a rabbit running around our home together! That sounds delightful! I have two cats who are sisters. When they pass on (hate the thought, and if I don’t pass on before them! ), I think I’m going to get a dog then, and a kitten as well so they can grow up together. “While I was planning on possibly adopting a dog, Ray was planning on adopting me. His strategy was clearly better than mine because he moved in with us in March 2013”. He certainly did. He made the first “move” towards developing a relationship with me. (ref. “Big Brown Eyes” – Jan 27, 2015. As do I. During my history of 5 cats and 3 rabbits, not one of them made such a demonstrative gesture. Hello to you and Ray…! I very much look forward to know more about you as well as Ray…and yes, you do the writing..I got the hang of it..:) ..I am Roopam by the way..
Well, teach him to touch type. There’s nothing like a bit of paws-on experience. Ah yes … didn’t think that one through. All the best. I LOVE the idea of your blog!! I am such a dog person and can’t wait to dig in to some of the stories you posted. I am, Colin and Ray, that you are constantly reading, commenting and liking my posts. Thank you so much! My Rocky was a Rottie/Shepherd mix and was a rescue. He was the sweetest, silliest, lovable oaf I ever met. In a sort of cosmic joke, I’ve switched gears and have gone from a giant goofball of a dog to a Westie. (shaking head) LOL He’s a good boy though. I’ve enjoyed reading your blog and wish you and Ray many, many years of happiness! Lovely page about you, but where can I see a photograph of you? What about you and Ray both wearing the same hat? With all the lack of privacy, I’m going to start only sharing portraits of myself in dark glasses or wide brimmed hats. Thanks for your speedy reply and the reasons why your blog about Colin and Ray features photographs of just Ray. I love Ray, so glad you share him with your readers. Ray has developed into a real “sweetheart” of a dog. He’s not perfect, but then neither am I, but I still had to share his story particularly as his history was assessed (background unknown) as very troubled. We too adopted a “challenging dog” with a troubled past. Sydney dubbed A.K.A. Sid Vicious by shelter staff & volunteers got labelled for “experienced dog adopters only.” At the age of one, he regularly bit and chewed the hand that fed him. His paperwork recorded having bit Vets and groomers. Plus he’d never been house trained. Of all the five adopted dogs I raised, Sydney came with the worst problems and habits. Yes, he bit us and groomers too. I muzzle, crate and house trained,etc. He’s one fun Snoopy happy dancer with a poodle brain! Awwww bless your heart for taking in a dog from a shelter! Funny how they can change your life, huh? 🙂 Thank you for the follow and I look forward to reading your posts! Definitely a blog after my own heart–and an owner with very much the same mindset to boot. I’ve owned a bucketload of animals in my life, some as pets and many as decorative lawn ornaments that required attention twice a day. But the hound I share oxygen with currently is the best animal I have ever met. I would give this guy a kidney. I adore him. I will look forward to reading your adventures with Ray. He must be a pretty special fellow to have turned your heart around as he did. I wish him a long and healthy life. I’m off to read “big brown eyes” now. I know I did read this page and usually comment when I follow someone. .. Anyway! Love your stories about Ray. He is so handsome. Heheh. I’m adding to your nomination list as well. I’ve nominated you for the Versatile Blogger Award. Keep those posts coming! Aloha and thanks for visiting our silly dog blog. We enjoyed reading Ray’s latest stories and will catch up on his older ones.